← One year of wedded bliss – ready for the babies now! We have moved again – this time, I hope it lasts longer than our experiences this past year!! The farm is beautiful, the house so big we get lost in it, the vistas breathtaking. My soul seeming to find peace, my hands finding work again. My sister and I have started sewing some pretty garments again, and I’ll soon post them for sale on our new post “Pretty Pieces”. We are going to feed the singles working around here some home-made meals and bakes, and make pap, wors and sous for the work-force. (Pap is a traditional maize meal staple food, and depending on whether you live in the south or the north, you vary the consistency – the south loves it more slushy, and the north loves it lumpy and stiff. Wors is traditional sausage, and sous of course is sauce – see further explanations below). Our yard is huge, the stars incredibly bright at night, and the thunderstorms severe!!! For those who know me, this means I live in the linen cupboard or passage next to it, during a storm. We got ourselves a delightful young domestic worker with the cutest face and posture, a brilliant smile, and a lovely personality. This in order for us two dames to apply ourselves to bringing in our share of income into the household as well. So we left for town this morning, to purchase some beads and buttons to finish off our budding high fashion items business, leaving her to get on with cleaning the carpets and floors after the umpteenth influx of moths last night left the surfaces covered with insects. Tired from running around small shops, Marietha and I came and flopped on the couch for a bit of feet-up, before tackling the next job. Next minute my otherwise African domestic worker came running through from Marietha’s room, almost snow-white with fright – she had encountered a curled up snake behind the set of drawers!! Scared stiff and unsure about what to do, I phoned my beloved and son, and then went and positioned myself on a chair in the passage, keeping a beady eye on said snake. Sakkie arrived soon enough, and heroically got rid of the perpetrator, who must have sailed in during the course of yesterday when Marietha left her sliding door wide open. It turned out to be an “Umfezi”, or brown spitting cobra in Zulu!! And she spent the night with him in her room!! Needless to say, no cajoling could get dear Yvonne, our domestic, back to work after that, and I had to look in every nook and cranny in the room, in case it came looking for a new love nest with its partner! Pap (pron. : /ˈpɑːp/), also known as mieliepap in South Africa, is a traditional porridge / polenta made from mielie-meal (groundmaize) and a staple food of the Bantu inhabitants of South Africa (the Afrikaans word pap is taken from Dutch and simply means “porridge“). Many traditional South African dishes include pap, such as smooth maize meal porridge (also called slap pap), pap with a very thick consistency that can be held in the hand (stywe pap) and a more dry crumbly phutu pap. A variety of savouries are used to accompany pap, made from green vegetables, and flavoured with chilli. 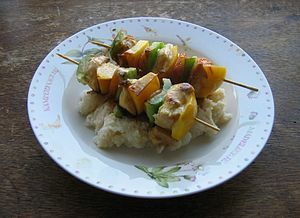 Afrikaners in the northern parts of the country eat it as a breakfast staple, with milk and sugar, but also serve it with meat andtomato-stew (usually tomato and onion) at other meals, When they are having a braai, stywe pap or phutu pap with a savoury sauce like tomato and onion or mushroom and cheese is an important part of the meal. In the Cape-provinces it is almost exclusively seen as a breakfast food. Since mielie-meal is inexpensive, poor people combine it with vegetables. It can be served hot or, after it has cooled, it can be fried. Phutu porridge is sometimes enjoyed with chakalaka as a side dish with braais. Pap is also called ugali in eastern and some parts of southern Africa; sadza/isitshwala in Zimbabwe; nsima in Zambia and Malawi; phaletshe in Botswana and banku in West Africa. Another South African name for it is mieliepap, from the Afrikaans words “Mielie”, meaning “Corn”, and “Pap” (“porridge”). In Nigeria, it is called akamu amongst the Igbo and ogi amongst the Yorubas with a consistency similar to American pudding. Ogi/Akamu in Nigeria is generally accompanied with “moin moin” a bean pudding or “akara” which is a bean cake. A similar dish is polenta, from northern Italy. In the United States a similar dish is known as grits. The primary difference between the US and the South African dishes is that in the US the maize (or corn) used is a yellow kernel maize, whereas in South Africa maize is especially grown for human consumption with white kernels, allowing the whole kernel to be used for the maize meal. Dishes similar to pap include isidudu, uphuthu, umpokoqo and umngqusho. This entry was posted in Africa, Nature, South Africa and tagged Africa, Afrikaans, Cobra, Pap, Shopping, Snake, South Africa. Bookmark the permalink. Pap sounds like something I would like. Anything with corn is hard to come by here in Thailand. We grow corn along with tapioca. I hope Yvonne returns. Cobras are a common snake here also. I’ve had to do in several but only because my wife would run away as well. We have them of every color and I’ve read that 90% of them are the spitting variety. Never seen one in action– thank goodness. As most snakes are shy and only want to be somewhere else when a human comes around I try to live and let live as long as they don’t get near the house. I even had a group of snakes mating in a shed. My helper allowed me to rid the area– he knows I enjoy animals– only to find out after the fact that I had been engaged dealing with vipers. The village had a big laugh. Danny, found more snake holes this morning, so we are now on high alert!! Pap is really simple to make, and we find a quick cook version here, which I love. Simply add water and stir. But if made from scratch, it is just a matter of boiling up some water with a pinch of salt. Mix some maize meal separately with a water until it has formed a paste, and then add to the boiling water whilst stirring vigorously. It depends on the ratio of water to paste as to how thick the end result is.